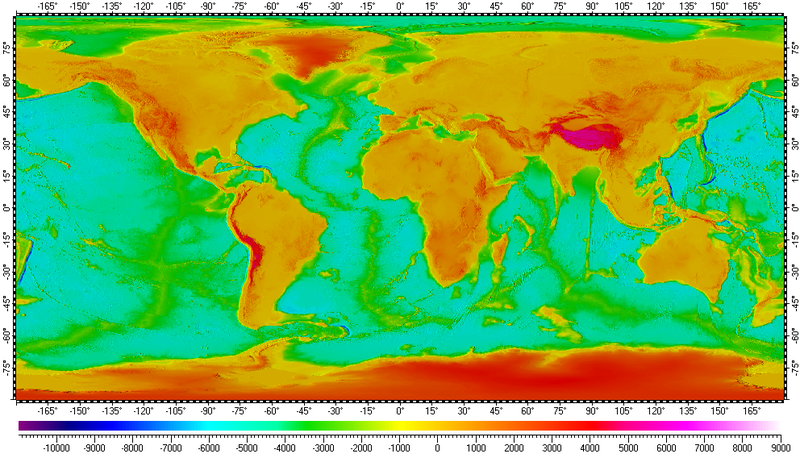 The datum of Digital Elevation Model of Earth with bathymetry, included in the archive, derived from raster data of SRTM30_Plus compilation of UCSD (University of California San Diego). Base resolution of the datum is 30". Also the datum contents set of spatial regions covering main geographical features of Earth, including continents, separated mountains, ranges, peninsulas, selected areas, islands, lakes and ocean floor features, such as trenches etc. Bathymetry.zip - Size: 861,368,254 bytes (821 MB); MD5: DEE67069C41A43575291C7CE586F6471.